With the outdoor pens getting increasingly muddy, it starts to become difficult to feed the pigs at this time of year. Luckily our main paddock has a large concrete pad onto which we can put the feed to avoid it becoming lost in the mud and we have also taken delivery of our first round of sow rolls in the silo. Normally we use the smaller sow pellets for the majority of the year, but during the winter the larger sow rolls are easier to feed and don’t get lost so easily. 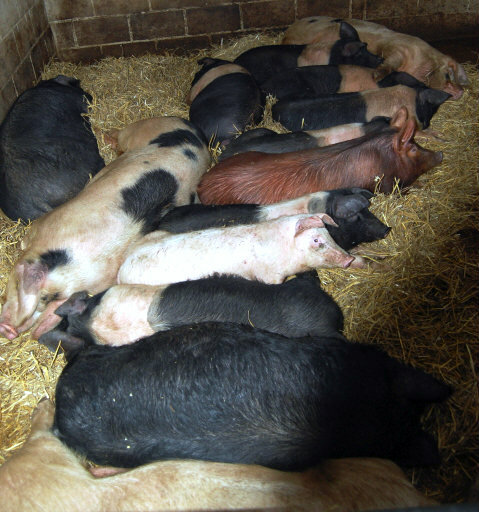 Whilst we still have a number of fatteners and young stock in the woods and about 15 sows left in the main paddock we have brought a batch of pigs into the straw filled barn to ease the pressure in the outdoor pens. And although the barn is over 50ft long, they all want to bed down in one corner, but they do seem content with this arrangement.